She lives a few miles from Daylight with her family and she joined Daylight in December of 2010. Her pre-school class teacher, Terry, says that Ann loves answering questions. Like most preschoolers, Ann likes to hang out a lot with her friends and is learning the alphabet and just starting to read. When she grows up she wants to be a doctor. In Kenya it is rare to find a female doctor, so we are proud to support her high ambitions! Please give Ann and her friends the gift of faith, education, hope, and love by making a monthly donation. Thank you to those who are supporting Daylight now, and those who supported us last year, in 2011! 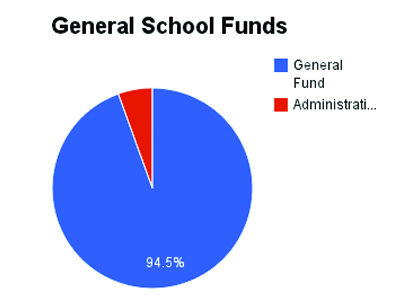 In 2011, donors gave a total of $60,761.65 to the Daylight General School Fund! We are very proud to share with you that $54,837.00 of those funds were used directly to benefit the children at Daylight. $3,204.71 (5.5%) from the General Fund paid for administration costs, such as donation processing fees from Razoo, and the remainder was put safely away in savings to benefit the children in 2012. In addition to these general funds, many people responded to special, designated costs, such as purchasing land, classroom and dormitory building costs, travel, and contributing to Director Michael Kimpur’s salary. 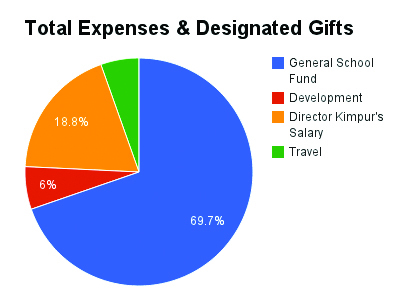 The pie charts included in this update help illustrate exactly where donors’ generous donations went in 2011. General Fund Expenses include all non-designated gifts made to Daylight. Administration costs went to House of Mercy Church in St. Paul. Be a part of the Daylight pie in 2012! Donate now.